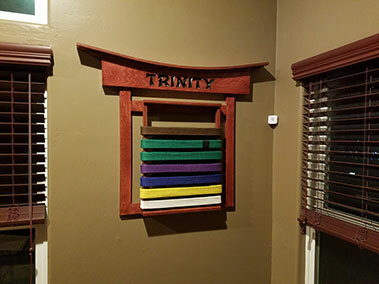 I wanted to make a Taekwondo belt holder for my daughter as she was progressing up through the ranks. I designed it in SketchUp, giving me a parts list to cut and machine. The top piece was bent by clamping and gluing it in place. The belts are held in place with zip-ties. Everything is glued together minus 4 pocket holes. A personalized rack to proudly display your accomplishments.